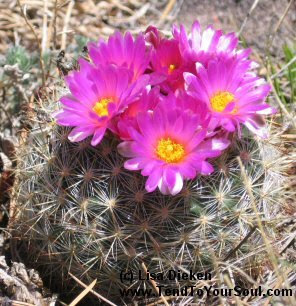 ~ I'd really like to see some cacti with the bright pink flowers, like the ones I've seen when I haven't had my camera. ~Several flowers on one cactus would be really nice. ~I would like them to be in a place where I could take some good photos. ~And I didn't say this, but I think the Universe knows it, is that I like them to be in the sunshine! So, off I continued on my hike, enjoying the sunshine, the warm, but not too hot, weather, the scenery, the fragrance in the air. Yum! About an hour later, I stopped in the shade to rest, drink and eat my "lunch". I turned around to take in the view and to my surprise, the most beautiful bright pink flowers were saying hello to me! Keep in mind that I saw no other cacti and flowers like this on the rest of the hike. If I hadn't stopped at this particular place, I wouldn't have this photo, though I may have been led to another place with a cactus in bloom. I'm no expert, but most cacti that I know of have their own flowers. They bloom in the spring. If you go to a desert at just the right time you'll see the desert in bloom! Law of Attraction book by Jerry and Esther Hicks and The Teachings of Abraham(R) "Ask and It Is Given"